Newly elected Uttar Pradesh Bharatiya Janata Party MLAs will meet in Lucknow on March 18 and are likely to elect their legislature party leader, a week after the party won the assembly elections with three-fourth majority. “Party’s central observers -- Union Minister M Venkaiah Naidu and national general secretary Bhupendra Yadav -- will be present at the meeting on Saturday at 5 pm,” UP BJP general secretary Vijay Bahadur Pathak said. With various pros and cons weighing heavily on their mind, BJP top brass has kept pending the decision on the next chief minister despite winning 325 seats along with its allies in the 403-member House. Sources said the party was extra cautious as it does not want to take one wrong step when it comes to Uttar Pradesh, where it stormed to power after a 14-year hiatus. Moreover with the next Lok Sabha election in 2019 in mind, the party cannot afford to take any wrong decision, said some insiders when asked about the delay in declaring the CM’s name. After a stupendous win in the assembly election, the party can ill afford to lower its guard in 2019 general elections. Uttar Pradesh sends 80 MPs to Lok Sabha and is extremely important in the BJP’s scheme of things. Party insiders said the overwhelming mandate has posed a fresh challenge for the BJP to meet sky-high expectations. Earlier, the party’s observers for Uttar Pradesh were expected to reach Lucknow on March 15 and the meeting with newly elected MLAs was said to be likely on March 16. As the supense continued, several MLAs made trips to Delhi for talks with party leadership. 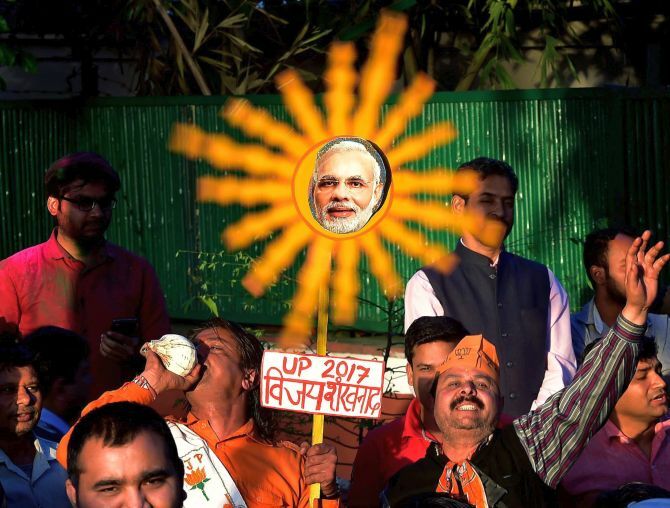 The caste calculus, meticulously stitched by BJP chief Amit shah and his team, which helped the BJP win, is a major consideration for deciding on the next Uttar Pradesh chief minister. The party also knows that given the kind of bumper voting it has got from both forward castes as well as non-Yadav OBCs, it would not want to upset the caste balance. There are talks that if the chief minister is made from one community, a deputy chief minister can be chosen from another community to maintain balance. Given the sheer sweep of BJP’s victory which extended beyond geographical and caste boundaries, the party can have the luxury of nominating a person for the top job who can deliver on Modi’s development agenda and the promise of putting down alleged lawlessness in the state under SP. As of now the names for the top post doing the rounds include Union ministers Rajnath Singh, Manoj Sinha and state BJP president Keshav Prasad Maurya. Singh, a former UP chief minister, is probably the tallest BJP leader in the state, while Sinha, an upper caste Bhumihar, too has considerable administrative experience. However, their choice could antagonise lower caste voters. Maurya, who had helped consolidate non-Yadav OBC votes in the party’s favour, is said to be in the good books of BJP chief Amit Shah. Another probable is Union Minister Mahesh Sharma, who has strong links with the Rashtriya Swayamsevak Sangh.